Today's post is slightly less glamorous than my recent posts, but just as important! 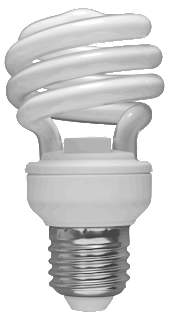 By now we've all heard how important it is to switch to compact fluorescent lamps (CFLs). Depending on your source these powerful little globes can use as little as 1/5 the amount of energy and last up to 15 times longer than standard incandescent bulbs, and are an excellent way to save on your energy bills and reduce your carbon footprint. But what do you do when they do eventually burn out? The bulbs contain a small amount of mercury and should be disposed of carefully so as not to contaminate land or water sources. Since CFLs last so long, this is the first time I've had to deal with this conundrum, and I want to do it right. In the US you can take them to any IKEA or Home Depot for safe disposal, or alternately check out www.Earth911.org to research your nearest recylcing facility. In Australia we can also take our bulbs to IKEA for proper disposal. Bunnings is trialling a CFL recycling program in Victoria and Western Australia. NSW Household Chemical CleanOut program offers free recycling of CFLs, batteries and other toxic household items. Planet Ark's Recycling Near You website is perfect for finding out where you can take your burnt out CFLs (or anything else you need to recycle!) across Australia. I'll be utilising the NSW CleanOut program, because luckily my closest drop off location is having a collection this weekend - I'll take the bulb and any other chemicals I need to dispose of at the same time. Since I only use homemade cleaning supplies now there are probably still a few chemical-laden potions hiding underneath my kitchen sink, and I know I have a dozen batteries lying around the place.